Any works which use this mod must be properly described and categorized. Content from this mod is not permitted for use in mods whose descriptions omit or obscure major changes that they make. Thanks to go to w00z and his Tune Da Radio mod for giving me the initial idea for how to do this. UPDATE: Added the first volume of compatibility patches. Volume 1 adds support for the CONELRAD 640-1240, Enclave Radio, R.A.C.E. Station, Radio Free Wasteland, and Wave Radio mods. Many thanks to Keleigh3000 for sending me the ESP files so that I didn't have to download gigs and gigs of data on my very anemic connection. To remind any of you who will be using these mods, there is a limit of 8 custom stations that the radios can be tuned to. Stations are added to the list on a first come, first serve basis. If you are running enough mods that you have more than 8 custom stations, I recommend you add one compatibility patch at a time, then save to ensure your favorite station gets added to the list. Does it drive you nuts that all radios in the game are pre-tuned to one station and can't be re-tuned? Well it drives me nuts too. At least one other modder tried their hand at changing that, but it had some slight side effects and wasn't exactly perfect. The core of the idea though was sound, it just needed some tweaking. And so with a little effort I've been able to put together an improved version of w00z's idea, but without the unpleasant side-effects. 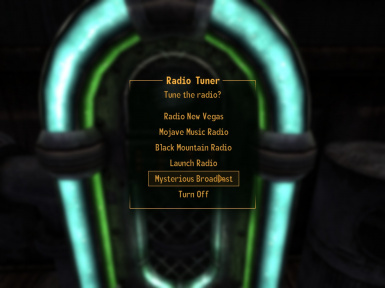 This mod alters radios and jukeboxes so that they can be tuned to most stations available in the Mojave Wasteland, but does so in a way that doesn't make the mod difficult to uninstall. If you don't like the mod's effects, just uncheck it from your load order and everything will go back to normal. No complicated uninstalling, no leftover weirdness. I have not added in additional niche stations like the Sierra Madre Broadcast or the Happy Trails Expedition as it would complicate this mod's requirements, and it's highly unlikely anybody would really want to leave a radio tuned to either station anyway. This mod also has support for mod-added radio stations, though it does not support them automatically. In order to enable them you'll need a compatibility patch which adds the station's broadcaster ReferenceID to one of the 8 Custom Station slots stored in the RadioTuning quest. Even after that the stations will only show up as "Custom Station 1" and so on, because this mod isn't NVSE-enabled. Currently there are compatibility patches for the CONELRAD 640-1240, Enclave Radio, R.A.C.E. Station, Radio Free Wasteland, and Wave Radio mods. If you would like support for a specific radio mod I am willing to make a compatibility patch, but you will need to provide me with a way of downloading only the ESP/ESM file for the mod without the sounds (i.e. NOT a 2+ gig download). My internet connection is not particularly speedy, so downloading hundreds of megs of data just to make a compatibility patch isn't high on my priority list. This does change the default station on Trudy's radio from Mojave Music to Radio New Vegas. Mind you, you can just re-tune it. If you do not have Old World Blues there is an optional Base Game Only version available in the downloads section. This version is identical save for the absence of the Mysterious Broadcast station.